ICAHT (institute of clinically applied hijama Therapy) would like to announce the launch of its first diploma course in hijama therapy. The hijama diploma involves a careful examination of the hijama procedure, undertaking an in depth study of its physiological mechanisms and interactions with human tissues and applying this understanding to live clinical cases and patient scenarios. The emphasis of the course is to produce practitioners with a comprehensive understanding of hijama therapy while taking into consideration, religious, cultural, psychological and social implications of its practice. The course is scientifically based, founded on in depth academic research of the topics and shares an abundant wealth of practical & clinical experience that is to be embraced by its participants. The diploma starts with an intensive face to face lecture based course delivered at Leicester University campus followed by implementation of the theoretical study in a clinical lab based setting where 20 hours will be spent with a Qualified Doctor practicing hijama on real patients seeking care. This flexitime arrangement will be coupled with home work assignments, case studies and a clinical reflections portfolio that will be assessed at the end of the 6 month duration. 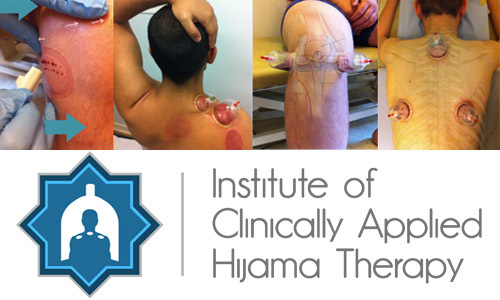 ICAHT is an abbreviation for the Institute of Clinically Applied Hijama Therapy which is an organisation based in the UK specialising in teaching hijama therapy at the highest clinical level. The institute was founded by a small a group of doctors, health professionals, academics and hijama practitioners with the goal of elevating the standard of hijama practice in the uk and furthering its understanding through research and clinical experience. A chiropractic Doctor highly experienced in the field of musculoskeletal medicine and hijama therapy. The Founder and Director of Hijama Centres UK (hijamacentres.co.uk) and an author of multiple articles on hijama therapy, back pain and shoulder disorders. A highly acclaimed Scientist & researcher practicing in the field of hijama therapy. Specialising in the fields of microbiology & cancer research. A Medical doctor who has become a full time hijama practitioner specialising in traditional Islamic and Arabic medicine as well as a guest lecturer on the topics of natural health and prophetic medicine. A Syrian Medical Doctor specialising in hijama therapy and a part time PLABs examiner. There are also a team of female practitioners that will be assisting in teaching female students. Compulsory attendance is required on the 10th ,11th ,and 12th of June 2013 and the additional 20 hours clinical experience will be completed on selected dates over the following 6 months. The assignments and case studies will be completed at home and the course will end on the 10th Dec 2013. The course will be held at Leicester University Campus in England. The course is being offered at the introductory rate of £749 with the Early Bird discount. Additional concessions are being offered to already certified hijama practitioners and a travel allowance of £150 is being offered to students travelling from outside the UK. Hi, this is SHARIFF ABDULLAH, an Indian living in KSA. Iam pursuing BASM (Bachelor of Alternative System of Medicine) with Cupping Therapy from Indian Board of Alternative Medicine, Kolkatta. I would like to learn Cupping Therapy. Please suggest if any in and around DAMMAM, JEDDAH, MAKKAH/MADINA. I had learnt PRANIC HEALING (Basic, Advance & Psychotherapy) from World Pranic Healing Foundation, Manila, Phillipines. REIKI (first degree, second degree and ART) from REIKI Center of India. Certified SUJOK Therapy (Basic, Advance) from INTERNATIONAL SUJOK ACCUPUNTURE ASSOSIATION, ONNURI, RUSSIA. Appreciate your positive understanding and prompt response. Jazak'ALLAHu Khair.!! "Sharing Knowledge increases the Power of Wisdom." ALLAH KAREEM.! !